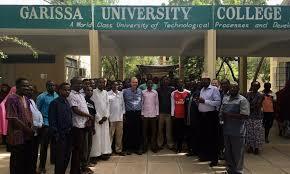 Garissa university first years hit 700 this year – Kenyatta University TV (KUTV). All Rights Reserved. This year’s 700 Garissa University first year regular students from across the country started reporting to the institution. This is the third group of students to be admitted since the University’s dawn attack on April 2, 2015 that left over 148 people majority of them students killed by the Somali based Al-Shabaab terror group militants. The first group saw slightly over 350 students admitted. Last year a similar number reported with this year’s admission of 700 students being the highest. Addressing the press in his office, the institution’s vice chancellor Prof. Ahmed Warfa said thanked the government, the county leadership and the community at large for the support they accorded the institution during the recovery programme immediately after the attack. “Most of the recommendations put forward by the security agencies that allowed us to re-open have been accomplished including a perimeter wall around the institution,” Prof. Warfa said. “There is a whole police post within the institution. There are police patrols at night. We want the students to not only to feel safe but to study in a secure environment,” he added. Adam Salim from Kwale County who brought his son told the press at the institution that he was skeptical about the institution’s security following the terror attack. “I am so relieved to see the security arrangements that have been put in place to secure the students and staff. The environment is good and I am confident that my son will complete his education here,” Adam said. His son Ramadhan Salim said that he was nervous and not sure of the institution security until he arrived. Media couple tie the knot!